The crisis roiling in Sri Lankan politics continues, with a possible turning-point coming up in early December. 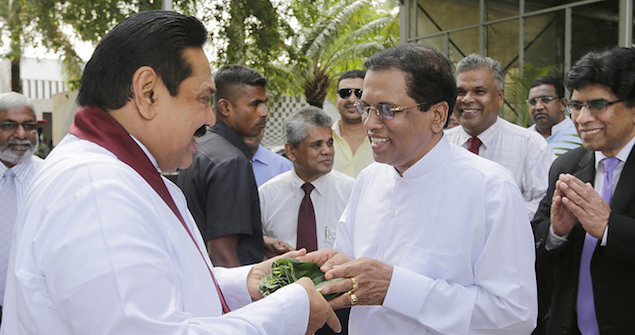 Since President Sirisena dismissed Prime Minister Wickremesinghe on 26 October and installed a former president of the country, Mahinda Rajapaksa, in his place, there have been plenty of twists and turns in the country’s turbulent politics. As well as dismissing the prime minister, Sirisena suspended parliament to provide his new prime minister with time to muster enough votes to win a confidence vote. Despite furious levels of horse-trading, it turned out that Rajapaksa was not going to attract enough votes to get him over the line. What should you do when parliament looks as if it’s going to vote down your prime minister? Dissolve parliament and call for early elections. And that is what President Sirisena did, or tried to do. But he relied on a very particular reading of Sri Lanka’s Constitution, about which the country’s Supreme Court was not immediately convinced. The court stayed the president’s order to dissolve parliament, and announced that it would hear petitions challenging the order from 4 December. Parliament was back in action. Its subsequent sitting turned out to be tumultuous, decorum abandoned in favour of disruption. Two votes of no-confidence in Rajapaksa’s Government were passed on the voices amid scenes of parliamentarians throwing whatever came to hand – books, chilli paste, water bottles and even furniture – in an attempt to disrupt proceedings. Normally a no-confidence vote would be enough to sink a government. Not so with the Sirisena Government. He issued a statement saying that he would only accept a vote by roll call or electronically-displayed votes. The latest instalment in this evolving drama has been a move relating to government finances: or “supply”, as will be familiar to Australians who recall their own constitutional crisis of 1975. President Sirisena is to make use of a constitutional provision enabling access to consolidated revenue without parliamentary approval to fund government expenditure for three months in 2019 to deal with necessary government expenses if parliament is dissolved. Consequently, the Supreme Court will hear petitions about the president’s decision to dissolve parliament from 4 December. A further decision on staying the operation of the president’s order, or a final decision on the validity of that order, is expected on 7 December, when the interim stay order expires. Trying to anticipate the court’s decision is problematic. A reading of the constitution – and it is a sure bet that the constitution has never been more read than in recent weeks – provides two very different hypotheses. In one place, the presidential power to dissolve parliament is stated outright; in another it is qualified with conditions that the president has clearly not met. One of the lessons from this episode is that there is nothing quite so precious as clarity in a country’s constitution. And what if President Sirisena’s order is found to be invalid, parliament reconvenes and Wickremesinghe wins a vote of confidence? President Sirisena has said that he will not re-appoint Wickremesinghe as prime minister, and seems to mean it, being driven by a deep animus against the man. It is a fool’s errand to speculate on outcomes; the likely scenarios are many, and as we have learnt already, we should expect the unexpected. When I wrote earlier this month, I mentioned that there were a number of issues to keep an eye on, including the progress of reconciliation, the economy and Sri Lanka’s international orientation. On reconciliation, the recent commemoration in the north of Heroes’ Day, formerly an occasion used by Tamil Tigers leader Prabhakaran to address his cadres and supporters, reminds us that the wounds opened by the war are still open. On the economy, Moody’s has downgraded Sri Lanka’s credit rating, expressing concern about the country’s capacity to service its debt. On foreign policy, it is worth noting that most ambassadors have been scrupulous in avoiding anything which might lend legitimacy to President Sirisena’s actions, with the only ambassador calling on Prime Minister Rajapaksa soon after his appointment being the Chinese ambassador, who was also recently seen in very public press coverage calling on the new foreign minister. It would seem China has a horse in this race.